Join us for an unforgettable break to one of Europe's most vibrant cities. 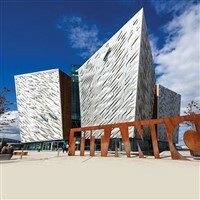 Discover the glorious Antrim coast and the magical Giant's Causeway and enjoy an included visit to the extraordinary Titanic Belfast Experience. The Belfast Loughshore Hotel is located in Carrickfergus on the Antrim Coast, just a 15 minute drive from Belfast city centre. There is lift access to the 68 bedrooms, each of which is tastefully decorated with duvets and throws. A morning departure we travel north to Cairnryan for our ferry crossing to Belfast. We arrive in Carrickfergus with time to relax before your evening meal. This morning we take a trip to the extraordinary Giant’s Causeway and its award winning Visitor Centre. (Includes admission, visitor centre facilities, orientation maps and use of a hand held audio guide). There is a shuttle bus available for the less mobile to gain easy access to the stones. Next up is the Old Bushmills Distillery, which is very popular for its Irish whiskeys, here we enjoy a guided tour (please note, there are numerous steps and stairs). You can also have lunch here (own expense), and wander the gift shop to see if you’d like to pick up any souvenirs. After breakfast at the hotel we travel to Belfast to visit the world-famous Titanic Belfast which tells the Titanic story through nine interactive galleries housed in its iconic building. Afterwards we hop back on our coach to enjoy a fully guided tour of Belfast and explore all of the cities exciting locations. We have a final breakfast at the hotel before retracing our steps back to Cairnryan and home.